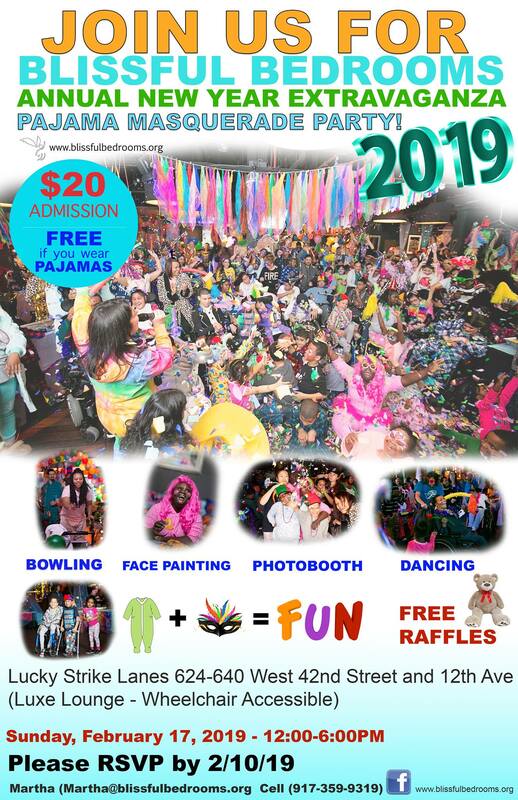 Blissful Bedrooms’ New Year Pajama Party is a much loved, and extraordinarily joyous, annual event carried out to celebrate the disabled youth in our community, and their families who care for them so selflessly. This gala is conceived and produced by a team of wholehearted and creative volunteers who work tirelessly, and go above and beyond to make it a fantastically exciting occasion that our special guests will remember all year long. One of the goals of Blissful Bedrooms’ mission is to create fun opportunities for disabled youth to get out of their bedrooms and together with friends, and believe us when we tell you, there are a bunch of wonderful individuals who are counting down the days until this epic party. We welcome partners in compassion who sincerely would like to help us make this event a spectacular day for our VIP guests. Get your FUNKY PAJAMAS, SASSY SLIPPERS and GLITTERY MASK ready because the Blissful Bedrooms Annual New Year Pajama Masquerade Party is going down! Come dance and bowl the afternoon away with us as we celebrate a brand new year in the comfort of your jammies!! For the 8th year in a row, Lucky Strike has welcomed Blissful Bedrooms back to their luxurious VIP Luxe lounge so we can create a joy-filled and excitement packed afternoon just for you! Tasty Sandwiches, a Cereal Bar and Yummy Cake will be served. We welcome food donations and Potluck offerings to help us create a delicious buffet for our guests! PLEASE BE SURE TO WEAR YOUR FAVORITE SLEEPWEAR AND A COOL MASK!! Admission is FREE for all who sport their PAJAMAS! Sorry, those who don’t wear their pajamas will have to pay a party pooper penalty donation of $20.00 – NO EXCEPTIONS and this year we will be strictly enforcing it. Your donation will be applied to a future project and we will lend you a robe for the party so you can contribute to the Pajama Party atmosphere. But we truly hope we don’t have to collect any party pooper penalties because we want to see EVERYONE looking comfortable and adorable in their very own pajamas. ***If you are traveling by Access-a-Ride, please make sure to schedule pickup times so you can take full advantage of the celebration as we have many activities planned, i.e., schedule pickup from home no later than 11:00 A.M. and pickup back home at 6:00 P.M. We have a lot of fun things in store and we really want you to be there for the whole time! Raffle will be held at 5:00 PM so please make sure you don’t miss it by leaving early. ***Street parking is available and multiple parking garages are located in the area. Parkright parking garage on 43rd street (between 11th & 12th avenue) was kind enough to give us a special parking rate for our event. They will charge $20.00 flat rate for a regular car and $30.00 for a minivan for the entire day, but you must get your parking ticket validated at the front desk at Lucky Strike and write BLISSFUL BEDROOMS on the ticket in order activate this discount. You can make a reservation ahead of time or just show up. Space is limited so please make sure you RSVP by 2/15 if you are planning to attend BUT SOONER IS BETTER. Everyone who is planning to attend must RSVP and invited guests are asked to bring no more than 3 additional people with them (please reach out if you have a special situation or a large immediate family). We are currently putting together a volunteer party task force for this much loved event. As you can imagine, this celebration takes a large, strong, creative and fun-loving team and we need committed and passionate individuals to help pull it off. It’s a full day gig starting with set-up at 9:00 A.M. and ending with breakdown at 6:00 P.M., but we promise you it will be a most memorable, fun and fulfilling volunteer experience! If you would like to volunteer for the event and/or donate food, or novelties, please email martha@blissfulbedrooms.org at your earliest convenience. If you have a party talent that you would like to volunteer, please reach out! Or anything fun you feel called to contribute to this festive event!! Unable to attend We sure will miss you! But you can still be there in spirit by making a donation at the link below to support this very special social event for disabled youth, as well as our upcoming charitable projects.